According to Manny Pacquiao's head trainer Buboy Fernandez, the senator will retire after three more fights. "Three fights and that's it," Fernandez was quoted by Roy Luarca of Rappler. "He has nothing more to prove." Pacquiao dominated Adrien Broner last Sunday (Philippine time) at the MGM Grand Garden, Las Vegas, Nevada to retain his WBA welterweight title. 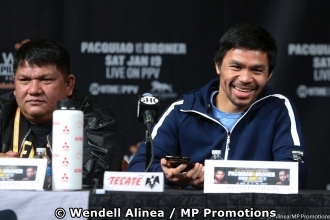 Fernandez feels that Pacquiao can fight the big names in the welterweight division, but the senator's boyhood friend believes the risks involved are high for the eight-division world champion. "There are many young and skillful fighters coming up, and all of them are hungry [for recognition]. We shouldn't wait for them to catch up," he said. Fernandez assures that Pacquiao will always work to be in 100% or even 110% condition for every opponent. But he is afraid of an off night when he faces some young and rising foes. "It's enough for him to regain the trust and confidence of the people," added Buboy. At 40-years old, Manny has already cemented his legacy in the boxing world. Fernandez disclosed that Pacquiao was very eager to knockout Broner, but he warned the champ from forcing it when he observed the brazen challenger from Cincinnati, Ohio changing his pose and giving up his jabs. This alerted him of the situation similar to Juan Manuel Marquez smashing Pacquiao on a counterpunch. "We're able to fly again, let's not wait for a crash landing," Fernandez said. "Anyway, we're way ahead on the scoring." Fernandez also told Rappler about Pacquiao's reaction to the reported burglary at his mansion in North Plymouth, Los Angeles. He was not at all worried. "Whatever were lost do not really matter. What matters most is the title is safely on our hands." Reports from several sources have it that Pacquiao suffered a scratched cornea in his left eye that came from the tape on one of Broner’s gloves. An eye specialist in Las Vegas made the confirmation Sunday and prescribed an antibiotic ointment to subdue Pacquiao’s left eye. The champion wears an eye patch to protect the injured eye until he consults another eye specialist in Los Angeles. Pacquiao said he suffered the same injury in his right eye in preparation for his fight with Jeff Horn last year. If the eye injury is not career-ending, the senator is expected to fight again not earlier than July. That period could give his cornea a lot of time for healing. Broner is confident his one-sided unanimous decision loss to Pacquiao will not blemish his marketability as a fighter. He has drawing power which made Showtime earn high ratings in his every fight. His loss to Pacquiao dropped his career record to 0-2-1 in his last three fights. But the viewers will still be drawn towards "The Problem" because of his haughtiness.